How can I support Washington Bikes? Please note: due to the merger with Cascade Bicycle Club (see more here), all members of Washington Bikes will be transferred to Cascade Bicycle Club as of January 1, 2016. As a Cascade Bicycle Club member, you’ll still be supporting exceptional state-wide efforts to make Washington a more bike-friendly state, you’ll just be supporting these efforts under a new name. You’ll also have access to wonderful membership benefits such as events and discounts. More information about Cascade Bicycle Club membership is available here. For more information about Washington Bikes and Cascade Bicycle Club memberships, please contact Ariana Rundquist at arianar@cascade.org. Donate to support Washington Bikes today! Contributions and gifts to Washington Bikes are not tax deductible because they may be used to support our political activities. ~$500 million in state funding for biking/walking projects in the 2016 transportation revenue package, on top of ~$120 million in the last 11 years for projects from trails to school-zone safety improvements. Over a dozen laws passed (and a few bad ones blocked!) for safety, education, and penalties for dangerous driving. Over 70,000 kids so far and another 15-16,000 each year learn to bike safely thanks to our Bicycle and Pedestrian Safety Education program for middle-school teachers in 42 school districts and counting. By 2017 we will have reached 100,000+ students in ~60 districts. Designation of the first US Bicycle Route in the Pacific Northwest and on the West Coast, with more routes and bikeways to come. Publication of the first book of multi-day bike tours in Washington state to come out in over a decade. Washington likes bikes: Even the cars say so! 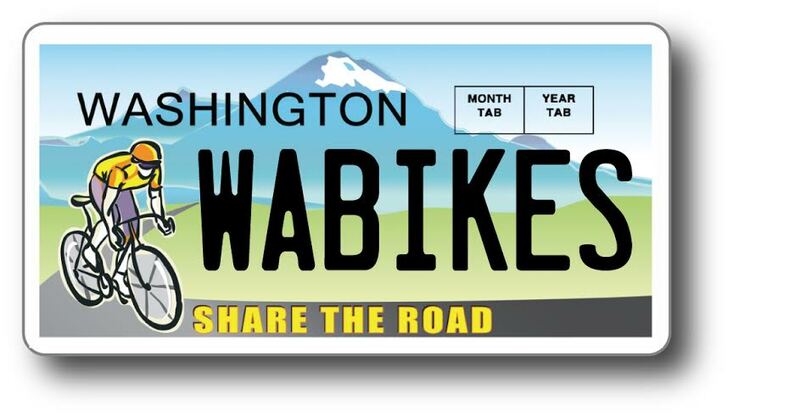 Get an individual one-year membership FREE** when you purchase a Share the Road License Plate for your motor vehicle (including motorcycles and trailers). This super-colorful license plate announces to the world that you support bicyclists, makes your car a mini-moving billboard for safe driving behavior, contributes to bike-friendlier streets, and supports safety and education programs. **Restricted to supporters who aren’t already members of Cascade Bicycle Club.